From my first trip to Sentosa. 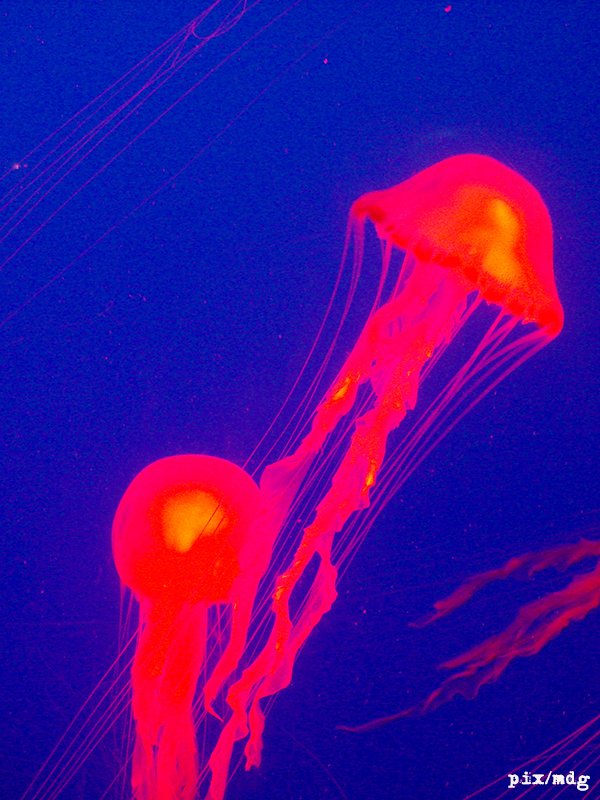 Jellyfish that reminded me of the cover art of one of my favorite records: Cutterpillow by the Eraserheads. I observed Good Friday so I abstained from the internet. Hence, you are getting this week’s Friday photo on a Saturday. In 2009 I saw an exhibit of Christian Lacroix’s costumes for opera at a museum in Singapore. It showed the actual costumes plus his wonderful fashion sketches/ illustrations. 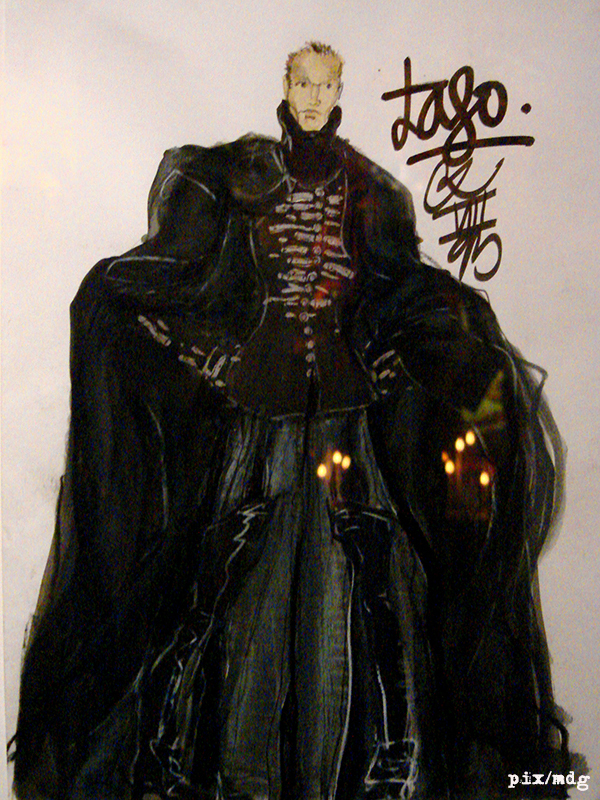 Here is his design for the character Iago, from the opera “Othello”. Between 2001 and 2004, my job took me a lot of times to Mindanao, specifically General Santos City and Polomolok, South Cotabato. 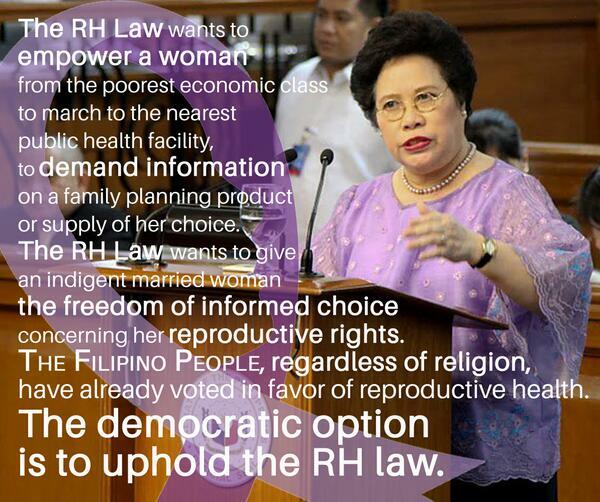 The NGO that employed me implemented a reproductive health project with NGO partners from these areas. I regularly traveled to these places to monitor the projects that my NGO was supporting. Aside from the occasional bombings and threats thereof, I enjoyed visiting these places, mostly because of the people. Speaking of our NGO partners, they were always very accommodating, professional, and friendly. The other thing I liked is the access to orchids and bromeliads that these places provided me. The director of one of our NGO partners in GenSan owned a hug collection of bromeliads, orchids, and other interesting plants and he often allowed me to wander in his garden when time permitted it. He had, in fact, on certain occasions have gifted me with bromeliads from his garden. Unfortunately, these were lost in the years that I stayed in Cambodia. Another NGO partner in Polomolok was friends with someone who raised orchids for a living and whenever I was in Polomolok she made sure to bring me there. During that time my mother thought she was in love with orchids while I was starting to get fascinated with Vandas, in particular. So every time I was in Polomolok I bought a vanda and brought it with me to Manila. By the time I left for Cambodia in 2004, there were about 10-15 Vandas in our yard, which my Father dutifully tended. 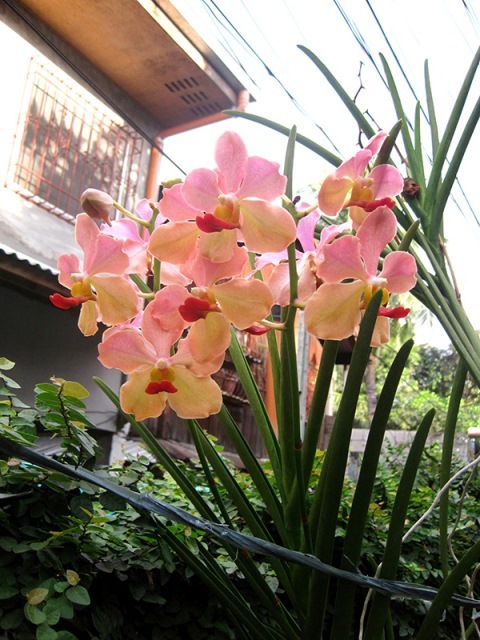 When I returned to Manila years later my father’s health had deteriorated so I took over caring for the plants. I like having plants around but I never thought of myself as a serious gardener. I mean I don’t even know the exact names of the plants in our yard. I always wanted to know the name of my Vandas. Thanks to the internet, I realized just how many varieties of orchids there are. The hybrids and crossbreeds add a layer of complexity. Luckily for me, I encountered this group in Facebook that prided itself in conserving orchids. So I posted a photo of one of my 10+ year-old Vandas while in bloom and asked for help in identifying it. As much as I wanted that name for my Vandas, they are simply not one and the same. Their lips have similar colors but the upper 3 petals of Vanda JVB are tapered at the tips and curled at the ends while my Vandas’ petals are wide and flat. So I searched for Vanda TMA but I kept on getting images of one called Vanda Tan Chay Yan. It took me a while to find an image of a Vanda TMA. I think I found the real name of my Vandas. The flowers look very similar, both in shape and in color. Although I must admit that the blooms of my Vandas have differing colors. This example, was shot back in 2006. This one was taken in 2010. I have seen bright yellow blooms in one of them but I have no photo. I hoped for a more exotic and glamorous sounding name but the one I got–while a bit boring–turned out to be controversial nonetheless. Apparently, when Vanda Tan Chay Yan was registered in 1952 by Singaporean Robert Tan Hoong Sian (naming it after his Father), the listed parents were Vanda Dearei and Vanda Josephine Van Brero. 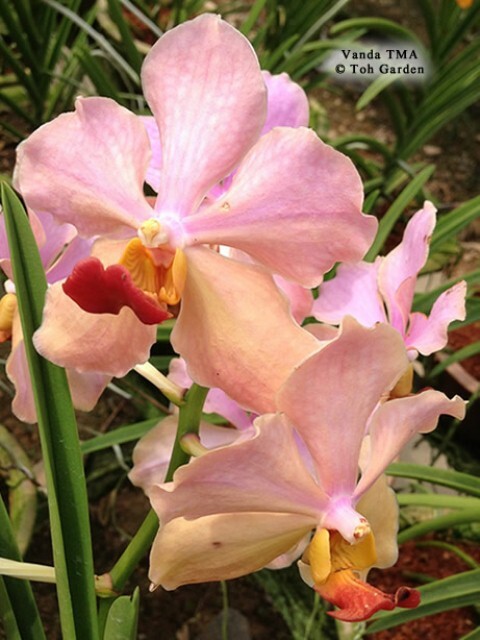 The new hybrid started to win awards everywhere and stimulated orchid growing in Singapore and Malaysia. 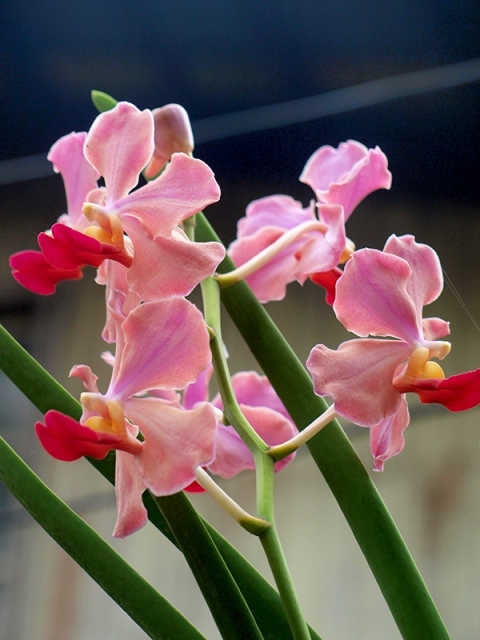 However, some orchidists cast doubt on the parentage of the hybrid. Soon another orchid grower, TMA Orchids, produced similar results when their hybrid bloomed, which used Vanda Sanderiana instead of Vanda Dearei. Still the nomenclature wasn’t altered. 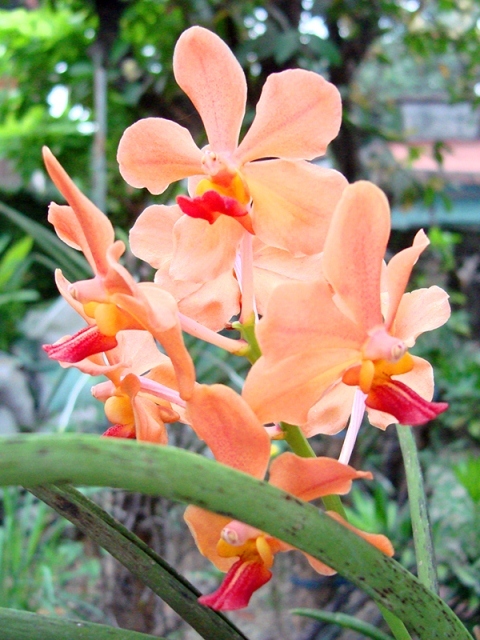 To this day, many knowledgeable orchidists still regard Vanda Tan Chay Yan and Vanda TMA as one specie. 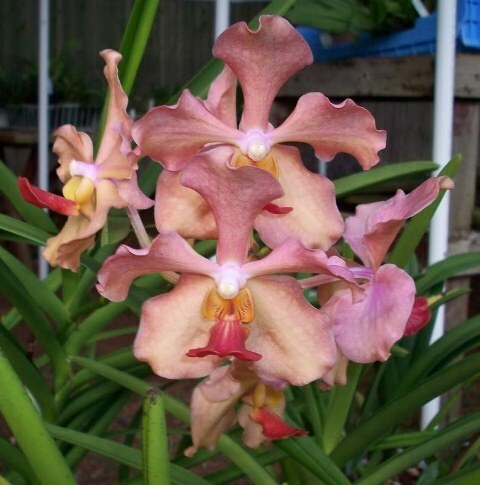 As for me, unless an expert will contradict me, I will use Vanda TMA as my Vandas’ name. 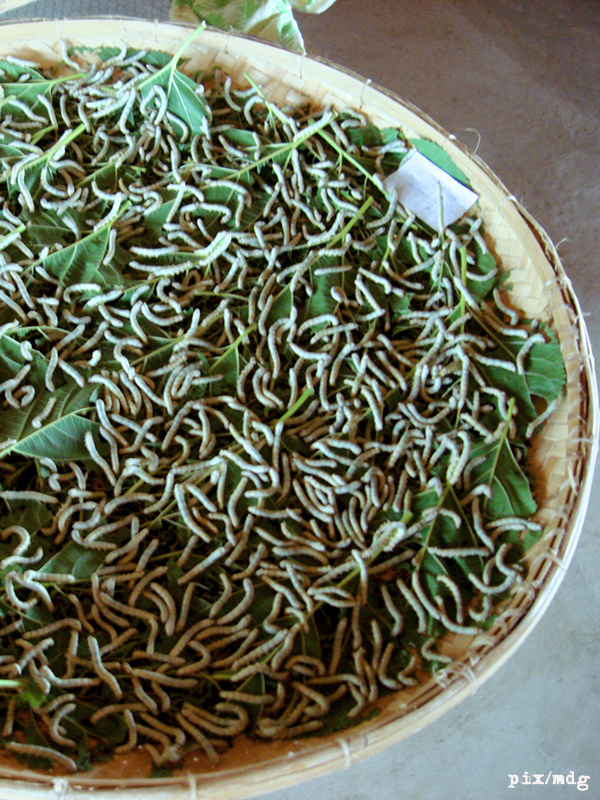 Adult silkworms. In Steung Treng, Cambodia.